Image: Marion Dean Ross, from Oregon Digital. Clark Hall. Dan Elbert Clark, History Department head, 1940s-1951 and co-founder of Pacific Historical Review. Douglass Hall. Matthew Hale Douglass, a university librarian, 1908-1942. 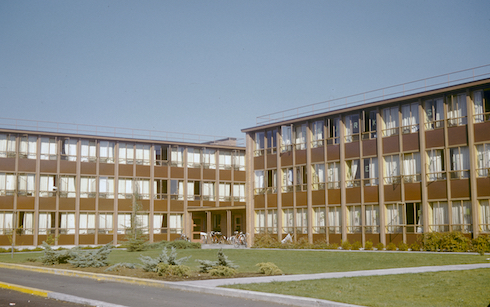 Smith Hall. Warren DuPre Smith, Head of the Geology Department head, 1914–1947. Sweetser Hall. Albert Raddin Sweetser, Botany and later Biology department head, 1902-1930s. Hawthorne Hall. Benjamin Hawthorne, Psychology professor from 1888–1909. McAlister Hall. Edward McAlister, College of Engineering dean, 1902-1925. Schafer Hall. Joseph Schafer, History Department head, 1900-1920. "Oregon's New Dormitory." Daily Emerald 7 Aug. 1957, 1. "130 Women First in 'Dorm n.2' This Fall Term." Daily Emerald 7 Aug. 1957, 1. "Dorm, Lawrence Hall Open." Daily Emerald 6 Sep. 1957, II, 5. 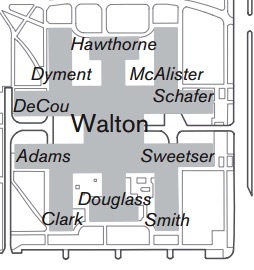 "Dorm now 'Walton'." Daily Emerald 7 Mar. 1958, 1. "Hall Dedication, Guided Tours Set for Walton." Daily Emerald 17 May 1958, 1. "Newest Dormoitory Addition Set for Completion by Next July." Daily Emerald 23 Oct. 1958, 7. "5 New Units of Walton Hall." Daily Emerald 5 Nov. 1959, 4. "Housing Office Makes Its Move to Walton." Daily Emerald 23 Jan. 1978, 12.